National Dog Bite Prevention Week is here! This entire week is dedicated to educating people of all ages about how to becomes more Dog Aware, and increase the safety of kids and dogs. We are focusing on the facts, not on creating fear. NOTE: There is a lot of information in this post. I recommend bookmarking this page, so you can read through it all when you have time, and so you can reference it when you need it later! The Humane Society of the United States reports that 50% of children will be bitten by a dog before their 12th birthday. Children under the age of five are most likely to be bitten and most of these bites come from a dog that the child knows; the family dog or that of a relative or friend. Children are most likely to be bitten in the face as they are closer to a dog’s eye level making it easier for a dog to feel threatened by eye to eye contact. 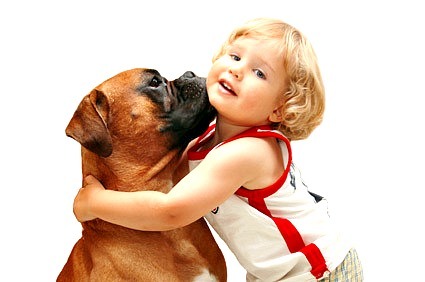 Children love to kiss and hug dogs, even though these expressions of affection do not translate well in the dog world. Fast movements can stimulate a dog’s prey drive and/or chase instinct. Higher pitched voices can sometimes startle a dog and make it fearful. A dog can be frustrated through rough play or by teasing and a child can inadvertently inflict pain with the pull of a tail or a poke in the eye. It is also hard for a child to read and understand a dog’s body language, therefore missing vital signals that can put them in harm’s way. Here’s the Good News: We can change the statistics! 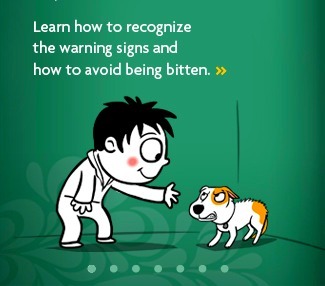 And, the majority of dog bites, if not all, are preventable. That’s where YOU come in. It’s our duty as dog guardians, parents, educators, and family members to learn how to read dogs better, and teach children how to learn dog “language” and to teach children to respect a dog’s space. The graphic below from Doggone Safe shows us a few signals that dog display when they are stressed. A very handy technique that I’ve learned, and now share with my clients is the “Pet-Pause-Respect Test”. This helps everyone in the family to know if the dog really wants attention or NOT. I highly recommend that everyone use the Pet/Pause/Respect rule when interacting with all pets. This is not cute. This is dangerous. The dog is being forced to interact with the child, and has limited options to get away. 1. Dogs don’t like hugs and kisses — Teach your kids not to hug or kiss a dog on the face. Hugging the family dog or other face-to-face contacts are common causes of bites to the face. Instead, teach kids to scratch the dog on the chest or the side of the neck. 2. Be a Tree if a strange dog approaches — Teach kids to stand still, like a tree. Trees are boring and the dog will eventually go away. This works for strange dogs, and any time the family dog gets too frisky or becomes aggressive. 3. Never tease a dog. 4. Never disturb a dog that’s sleeping, eating, or protecting something. 5. Teach your kids to Speak Dog, and only interact only with happy dogs! 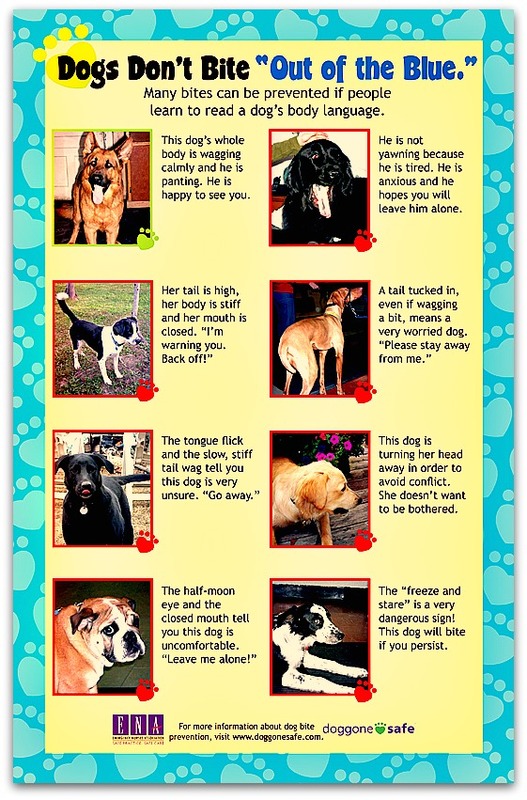 Watch this short slideshow that shows you how to read dog body language, and other safety tips. 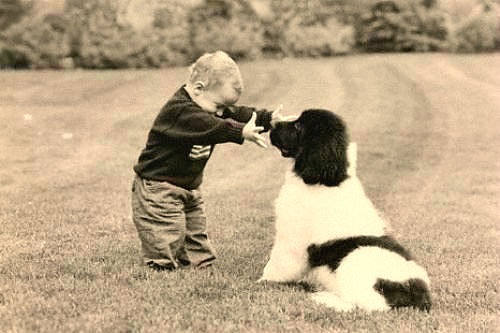 Familiar children were most commonly bitten in relation to food or resource guarding and “benign” interactions such as petting, hugging, bending over, or speaking to the dog. 1. ACTIVELY Supervise — Passive supervision is something we are all guilty of, even if you don’t have kids. 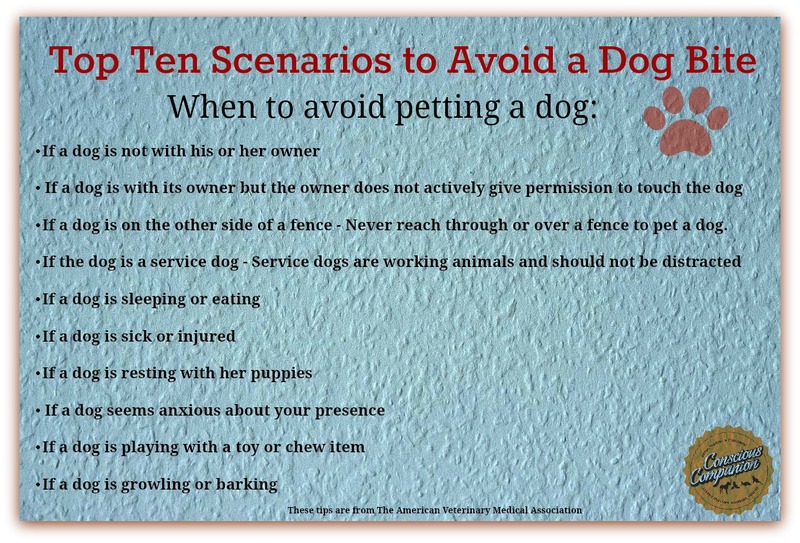 But active supervision is a must when there are pets and children in the home! 3. Learn the Dog Behavior Continuum: We hear it all the time, “Kids and dogs should never be left unsupervised”. That’s great advice, but what else should we be doing?? Supervision only works when we know what to look for and when it’s time to intervene. We have to know when a dog is going from “Enjoyment to Tolerance, to Enough Already“and back again. 4. Don’t assume your dog is “good with kids”. All dogs have their breaking point. We all do. Even if your dog is great with kids and has never bitten before, why take a chance? Toddlers, babies, and dogs don’t need to physically interact! 5. Train your dog positively Never pin, shake, choke, hold the dog down, or roll the dog over to teach it a lesson. Dogs treated this way are likely to turn their aggression on other family members. 6. Involve older children with positively training your family dog (while supervising). 7. Don’t allow children to punish the dog, and don’t punish the dog yourself. 8. Condition the dog to enjoy the presence and actions of children using positive experiences. 9. Understand and learn to recognize Trigger Stacking. 10. Understand and recognize the Ladder of Aggression. What’s Your Style of Supervision? Actively Supervise! Supervise your dog around children at all times. If visiting children are bothering your dog (or other pets in the house), put the pets away safely, or send the children home. Be your child and your dog’s advocate. Parents and guardians must be responsible for their dog at all times, without exception, and especially around children. A child should NEVER be left unsupervised with any dog at any time and dog and child should only be together when a responsible adult can actively supervise. This keeps both children and dogs safe. Visit The Blue Dog Project for more about children and dogs. Are you willing to bet your dog or your child on that statement? Why take the risk? There’s no better time than now to educate each other about how each of us has the power to keep everyone happy and safe. This week is the perfect time to reflect on how we can ensure our canine companions, children, and others steer clear of unwanted and preventable circumstances. Education is the key to safety and well being for everyone in the home. Please share this to help educate others so we can all work together to keep dogs, kids, and families happy and harmonious 365 days a year!